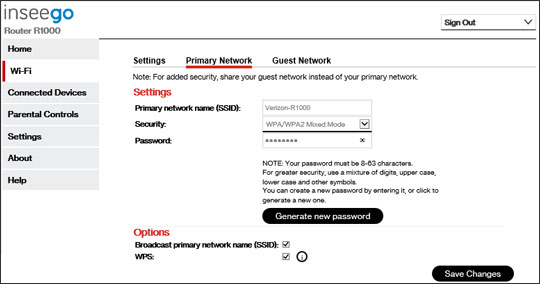 También puedes change the network name or password from your My Verizon app. From the Wi-Fi panel, click the Arrow icon . 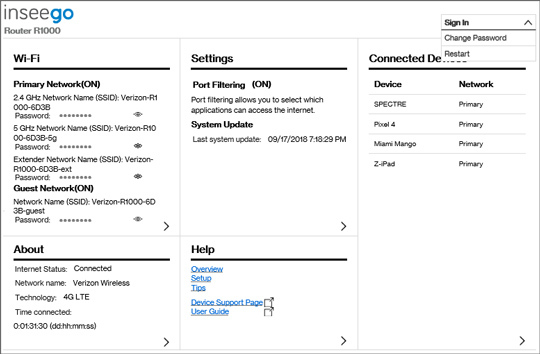 From Wi-Fi, click the Primary Network tab. Password must be 8-63 characters and is case sensitive. Click the View icon to display the current password. Alternatively, click Generate new password to have a password chosen for you. Broadcast is enabled when a check mark está presente. WPS is enabled when a check mark está presente. Click Save changes (at the bottom).